We’re over a year into the life of the Apple Watch, which means there are a ton of accessories available for the wearable now. From stands to help you charge your Apple Watch in style, to interesting new bands and accessories made by Apple itself — there’s definitely a lot to choose from these days thanks to Apple's Made for Apple Watch program, which gives third parties the specs for the watch's design so they can make accessories for it as well. Here are a few of our favorite accessories that have been released for the Apple Watch. if you just got an Apple Watch for the first time, or are looking to give your Apple Watch a bit of an upgrade, then give some of these a try. Arguably the first accessory that anyone should consider purchasing for their Apple Watch is a new band. Apple has made a number of new bands available for the Apple Watch over the course of the year, and a number of third-party manufacturers have joined in to offer stylish new seasonable options for the wearable. Your average Apple Watch band costs around $50 and can be great for giving your Apple Watch a new look on the fly. For instance, a Milanese loop might be perfect for the office, but when you hit the beach with your friends on the weekend a Sport band or one of the nylon bands that were announced for summer are probably a better fit. Our favorite third-party bands come from Case-Mate, which also joined forces with designer Rebecca Minkoff on a number of stylish bands. New bands can definitely get expensive. While we’d definitely recommend springing full price for bands you plan to wear every day, if you’re looking for something just to use every now and then, we’ve found a number of interesting band options on Amazon that are definitely worth a look. For instance, you can purchase a third-party Milanese band for $30 or less on Amazon, that’s less expensive than the Sport band is in the store. With some of those third parties, you’re also getting a varying degree of quality. Be sure to check the reviews before you place an order, and be cautious when buying a high-cost band from a company you don’t know that doesn’t have any reviews on the site. That said, there are deals to be had, and you can update your Apple Watch band collection fairly affordably if you’re willing to buy some off-brand bands to accompany your others. The company Casetify is also a favorite and has a number of interesting bands available for the Apple Watch. Even better, it also offers the opportunity for users to design their own Apple Watchband. Bands include a Faux Leather option as well as a number of interesting designs ranging from tribal prints to pastel tapestry. And if you’re concerned about your Apple Watch battery making through an entire day, then the WiPowerBand might be an excellent choice. The band isn’t exactly the most attractive watch band option on the block, but it has a built-in 250mAh lithium-polymer battery to make sure the wearable keeps ticking well into the night. The 38mm version of the band is $89.99, while the 42mm version is priced at $99.99. Speck is known for its cases for the iPhone. 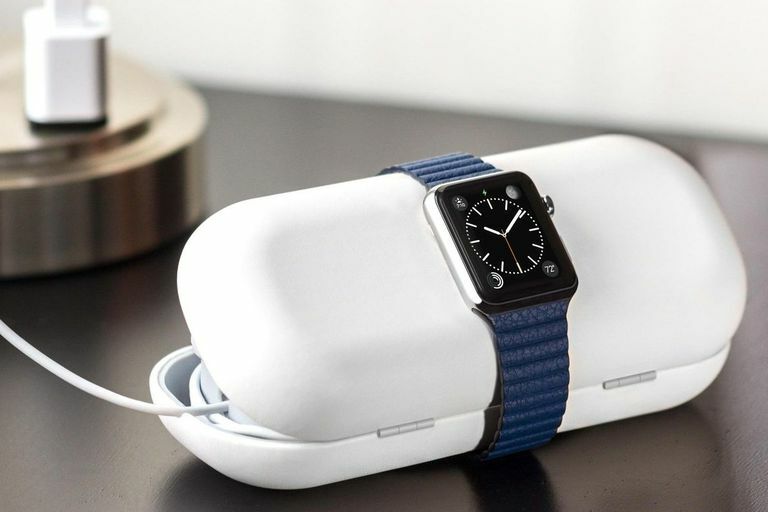 The company unveiled a version of its popular case made just for the Apple Watch as well. The protective plastic case is available in a clear color as well as colors that match the Apple Watch’s Sports bands and puts a protective shell over the Watch. To be honest, the case definitely bulks up your Apple Watch, but if you’re someone who works in an environment where your Watch might get a few bumps and bruises during the day, or if you live a particularly active lifestyle, then Speck’s Candyshell for the Apple Watch might be just what the doctor ordered. The case is exceptionally easy to take on and off and gives your Apple Watch an extra layer of protection to handle the battle with whatever life might throw at it during the day. Even better, the cases are just $25, so you won’t break the bank keeping your watch protected. As someone who managed to crack the screen of her Apple Watch accidentally during her first few weeks of ownership, I really love that I can add a layer of protection to my Apple Watch when I know I'm about to wear it into a situation where it might potentially get a little beat up. There have been a ton of different Apple Watch stands released over the course of the year. If you’re in the market for one, you can choose from Apple’s official stand, or what seems like an infinite number of third-party options. One of our favorites is the WatchStand Powered Charging Station by Griffin. At $60, it’s a little less expensive than some of the other options out there, which is always a plus. Our favorite part of the stand; however, is that it works as an iPhone charging station as well. In all honesty, most of us are likely charging our Apple Watch and our iPhone at the same time each day. For me, that involves plugging everything in right before I go to bed. With the WatchStand, you’re able to place your Apple Watch and your phone side by side and charge them together. Arguably you could do the same thing by simply plugging them both into the same outlet, but there’s something great about having both of them together, and organized, for when you wake up in the morning and need to get them. The WatchStand has built-in cable management for the iPhone and Apple Watch to keep things streamlined and looking good and has room on the inside of its post to store the rest of your Apple Watch’s charging chord (that thing is long!). The stand portion of the device can hold both the 38mm and 42mm versions of the Apple Watch, and the Watch can be positioned vertically or horizontally. That means that if you have the stand set up on your bedside table you can still take advantage of the Apple Watch’s nightstand mode. Apple purists can still get into the watch stand game with Apple's official charging dock. Unveiled last November, the $79 is essentially just around disc where you can place your Apple Watch when it needs a charge. The disc still requires you have your Apple Watch charging cable (as most do), which makes its $79 price tag a little more difficult to swallow. That said, for people who love the signature Apple "look" the official Apple Watch dock is probably right up your alley. When it comes to the Apple Watch, in most cases packing what you need for the device involves simply throwing that (very long) cable awkwardly in your suitcase and hoping it doesn’t get tangled up with your iPhone cable that’s also in there and all your other stuff. Twelve South is known for making amazing accessories for Apple products and its TimePorter for Apple Watch is one of our favorites. The devices is both a case for transporting your Watch as well as a stand for charging it. Inside you can store your Apple Watch, of course, but there’s also room for extra bands and your cables and USB charger. That means not only can you bring everything you want with you, but you can also do it in a safe and organized way. The case itself becomes the charging stand which is both genius and ensures you don’t accidentally leave it behind in a hotel room. When it’s time to charge, you just position the charging disk from the Apple Watch charger into a slot on the top of the case. Snap your Apple Watch on, and you’ll be on your way to a fully-charged watch. We really love how easy it makes it for you to bring everything along with you (having an extra band on the road is always nice! ), and the case turning into a travel stand is a magical thing that once you use it, you’ll likely not know how you ever traveled without it. We also really like this charging case for the Apple Watch. It's not quite ready for production just yet, but we love the idea of being able to charge the Apple Watch while you're transporting it. You're able to kill two birds with one store and keep your Apple Watch protected while you're on your way to your next big adventure. More than just a case, Amber also has an accompanying app that adds a bit of additional functionality. Specifically, the app is able to send you a push notification when your Apple Watch is fully charged (so you don’t have to keep checking on it), and the app can help you find the entire case if you happen to misplace it. The tracking is done through Bluetooth, so it’s more something that will help you figure out where you left the case in your home rather than something that will help you track it down if it’s stolen (Bluetooth has a short range); however, still a fairly useful feature if you tend to be a bit forgetful with your gadgets.